So it has been a rough week for the piggies. We lost Sofia at the Sunday night due to illness, and today the three remaining females decided they were to fight it out. The other two are fine, but Maggie has a hole in her cheek. 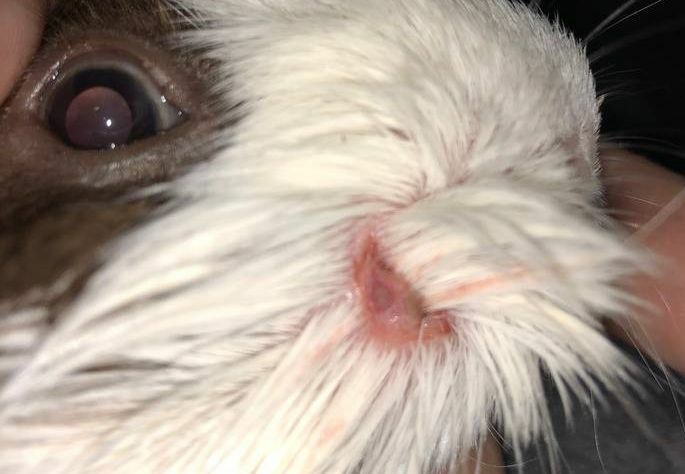 It doesn't look as if it's more than a small cut at first, but there is hair connected to a flap of skin, which is covering a hole in her face. The hole goes completely through the first layer of skin, seemingly forming a pocket. The only cavy savvy vet relatively near me (over an hour) cannot get her in until next week. As soon as it happened, I separated them and tended to Mags. I didn't have any antiseptic solution on hand, but I wanted to kill immediate germs, so I dabbed it with a q-tip soaked in hydrogen peroxide then one soaked in warm salt-water. After doing a little research, I then put a TINY amount of antibiotic ointment (triple antibiotic with Bacitracin, Neomycin, and Polymycin B) on a q-tip and put just a bit inside the pocket. I then gently closed the flap and smoothed her hair down to try to prevent her from getting to the antibiotic ointment. It did not seem to hurt at the time (12 pm or so), but that may have been shock or trying to hide the extent of her injury. It's now 9:30 pm and she did not seem to be in pain until I lifted the flap to take a picture. 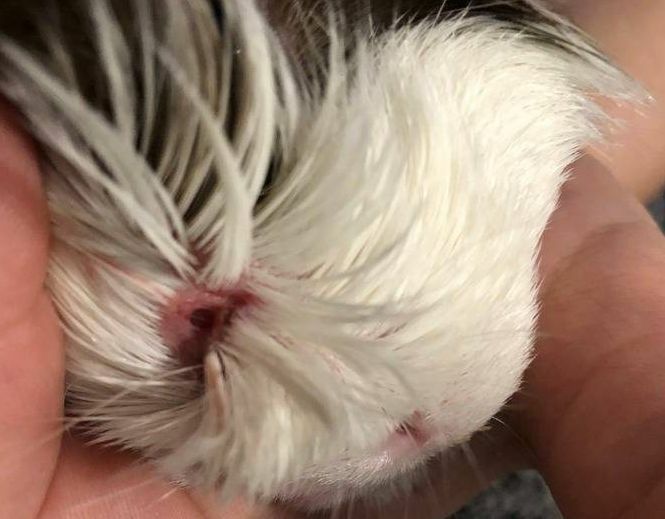 I know abscesses can form in these types of wounds in far less than a week, and I would like to prevent that until she can get into the vet. Any suggestions? A couple different angles of the hole, the last one is with flash on. Don't use hydrogen peroxide. It went out of favor 25 years ago, and will actually damage tissues. If you wind up needing to clean the area, use sterile saline. 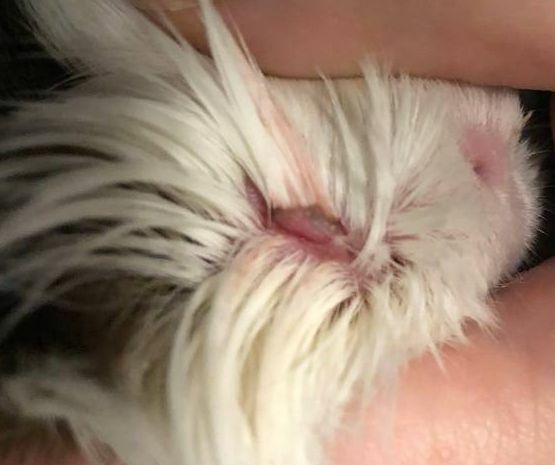 Abscesses usually occur when a wound heals over too soon, and if an abscess is lanced, it has to be kept open and flushed to keep it from recurring. In this case, there's no infection in the area, so I wouldn't flush it. But I would keep it open, even if you have to soak any scab that's on it and pick it off. Keep using the antibiotic cream -- tiny amount, applied with a q-tip, twice a day. But I would see if I couldn't get the vet to see her sooner. If any infection develops, she'll need oral antibiotics, and the longer you have to wait to start on them, the longer it will take to clear it up. Thanks bpatters! I unfortunately had read about hydrogen peroxide no longer being used about 5 minutes after putting it on her. :( We still use it so often on farm animals and humans, that sadly it was the first thing I thought to do before doing much reading. Hopefully just one Q-tip didn't hurt her too badly. I luckily have TONS of sterile saline laying around if I need it (thank you, pharmacy school). Thank the Lordy. 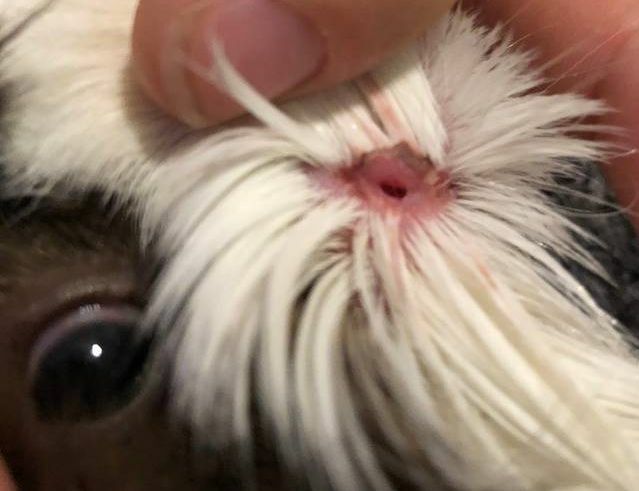 I have seen some nasty abscesses on dogs and cattle form rather quickly from seemingly small wounds, and I was mostly worried about her getting one. I'm glad it's fairly preventable for Maggie. As for the vet, they're supposed to call if they get any cancellations. The surrounding emergency vets (within a 90 mile radius) are all dog and cat only. When Sofia got so sick, I called every vet in the surrounding area (again, in about 90 mile radius) that I could find online and then even moved on to the phone book in case there was an old-school cavy savy vet who didn't use the internet or something. Only three saw 'exotic animals'. I called those three again today, and one is still on maternity leave, one is on vacation, and the other is the one who can get me in next week...and he's the same one who has seen my other guinea pigs for check-ups and various things. So here's hoping someone decides they don't really want to neuter their guinea pig and his schedule clears up. I do know their really busy right now since I'm pretty sure he's one of the only people in this half of the state actually at work at the moment. He had me email him pics to see what was going on, and he apparently didn't seem to think it was emergent enough to work me in or have me come in right after normal hours like he did with Sofia. Hopefully, if it does start looking worse in the next couple days, he will work me in as an emergency. A curved tip syringe is great for flushing injuries. Warm sterile saline solution works best (more comfortable if you warm it). Let me know if you'd like your pics added permanently to your thread for future readers. Thank you Lynx! I read about that on a few of the other medical posts when I was trying to figure out what to do; I'll have to hunt me down one. Adding pics permanently is fine! Update: The vet called at 7:30 this morning and told me his 8 am cancelled. It's about an hour drive there, but he waited for me. He decided that the wound was not as deep as it appeared, and he believes it will heal fairly quickly with proper treatment. He doesn't believe in prescribing antibiotics until there's a true problem. He claims that even when he sends them home and tells pet parents not to give them to their pets unless an infection starts, there's too many that end up giving antibiotics to their pet unnecessarily out of over precaution and causing undue GI upset. He did, however, clean it out really well with diluted Betadine and then put a bit of antibiotic ointment. After that, he basically gave the same advice as bpatters...he said when the hole starts to close let it, because there's no damage tissue behind it; it's simply a tear. However, I just have to make sure the flap doesn't heal shut before the hole does or it could cause an abscess. Since the hole itself isn't that large in comparison to the flap of skin, he doesn't think that should be a problem. He said to keep doing the tiny bit of antibiotic ointment in the pocket 2-3 times daily and if it started looking like it might be getting the beginnings of an infection to flush it out well with sterile saline or diluted Betadine, and if it had a very obvious infection to call him and he'd get me set up with some antibiotics. 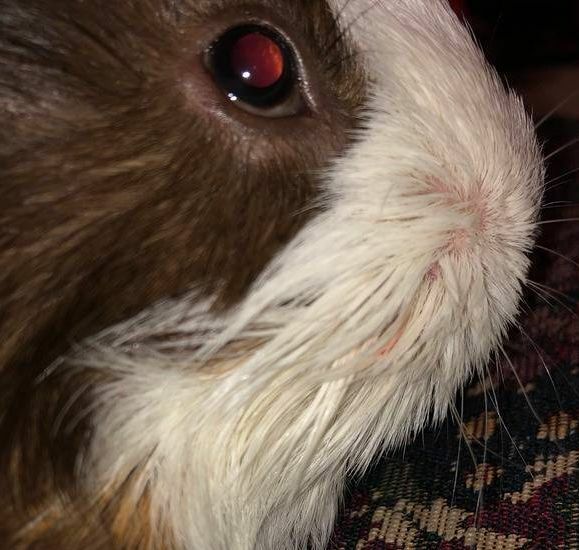 Trying to get a tiny drop of antibiotic in a tiny little hole on a very squirmy cavy should make for a fun couple of weeks; It breaks my heart for her because she doesn't realize I'm doing it for her own good and not trying to purposefully hurt her. Y'all...I've taken two veterinary compounding pharmacy courses at school and we do cover guinea pigs, but not nearly enough to handle anything like this. It's no wonder there aren't enough exotic pet vets and exotic pet compounding pharmacies around when they don't even really cover in classes what meds they can and shouldn't receive (besides obvious ones like penicillins and most topical ointments). I've learned more from a few months with these babies of mine than I learned in a year of classes. I will try to remember to add your pics once I get this old/new computer set up (no ftp program on it yet). Mags was having issues with her wound, and scratching it considerably. I know healing wounds itch, bu she was doing more damage to it than what was already there! I called the vet and he said to bring her back in to check and make sure it wasn't getting an infection or anything like that. The hole is already starting to look better, which is a good sign. The flap it's connected to is not. 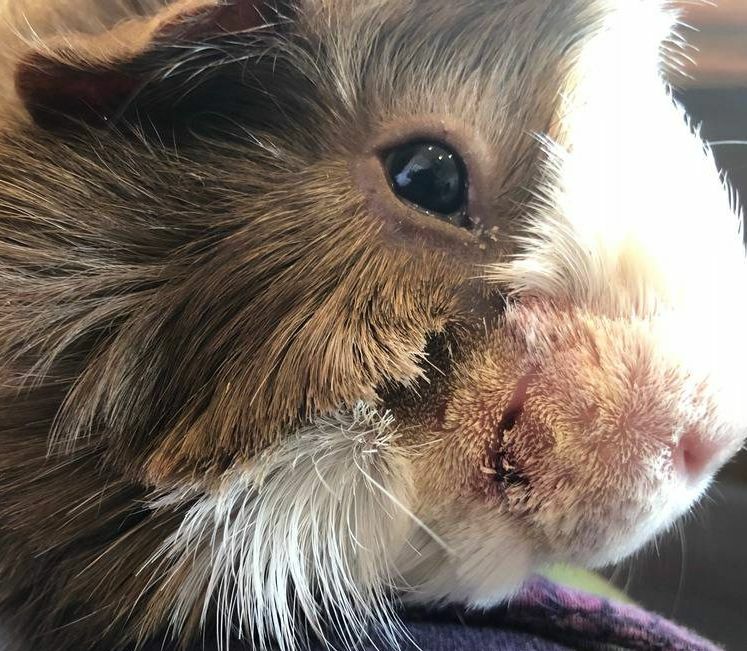 The vet decided that it was time to shave that part of her face so we could keep a better eye on it. The sound didn't bother her, but when they touched her she freaked out. The vet decided we needed to put her under, and she'd have to stay overnight. That seemed extreme to me, and I finally convinced him to let me hold her while he tried shaving her again. He was reluctant for fear she would bite me, but I let him know I'd rather take a bite than have her deal with the anesthesia. Luckily, she was calm so long as she was held, and she let him shave that side of her face. He decided to put in a stitch to keep her from scratching the flap open wider, and was going to do it with no anesthetic so she would only have to get stuck with one needle. She let him know that was not happening. Soooo...she got a lidocaine shot, and she was NOT happy. She got one tiny stitch, and he left the side open a little so it can drain in case it does get infected. He decided against antibiotics since there's no sign of infection and it's healing well, but wants to do a daily diluted betadine soak. Poor baby looks like a goofball, but she definitely seems in less pain and has completely stopped scratching. I'm not sure when the lidocaine will wear off, but here's hoping she stays that way once it does. Oh, my. What an adventure! Poor little girl! I also hope it heals well. T'hose curved tip syringes are easy to find on Amazon. That's where I got mine. Good luck and do keep us up-to-date. I just thought I'd let everyone know the stitches have dissolved out, and Maggie is doing wonderfully! Thank you everyone for all of your advice. Hey! I've talked about this a bit on their chronicle, but not on here. When I first got some of my girls, they had bad fungal infections and mites. They were treated and they're all healed now. Side note, ringworm is a flipping nightmare; I just finally got over it myself after two months of intense treatment...they had to culture mine, and it turns out I had a resistant strain...which means they did too! Anyway, back on topic, they all had several ketoconazole baths to help them get over the ringworm. The short-haired guineas are fine, but Maggie has been left with what the vet said is just dry skin and fur (like humans with long hair if we wash our hair too much without conditioner or a conditioning shampoo). Since it's not detrimental to her health, he didn't have any treatments to recommend, but I was wondering if anyone had any tips or products that may help? Someone recommended me Manuka & Neem Shampoo, but since required frequent bathing got us into this mess, it seems counterintuitive to bathe her more? If this helps, we recently found out Maggie is also likely part Peruvian. I found this out by discussing with a guinea pig rescue about Maggies fur...the other abyssinian's fur never got very long, but Maggie's grows like a weed! It will get so long it'll start being floor length and she has to get regular cuts (I'm horrible at that, but learning), and after looking at Maggie she says she likely is at least half Peruvian! She does have some rosettes/cowlicks, so she may be mixed with an abby (she was a rescue, and her previous owners knew nothing about her as they got her from a pet store). So I don't know how that plays into their skin/hair care, as I'm not familiar at all with the breed. I think one calls it guinea pig hair instead of fur (I read this somewhere). There are individual hair follicles. Cold pressed coconut oil might be another thing you could use the moisten the skin and hair. It's spendy but Gorgeous Guineas (from UK) has a great shampoo & conditioner. I have one of those fuzzy critters :o) whose hair picks up absolutely everything. The GG works great at keeping her hair and skin clean and conditioned. Thanks for the correction Lynx! I'm pretty sure I've never heard anyone call it fur before, so I'm sure you're right. I'm so used to having dogs that I still slip up on the terminology! I have some cold-pressed virgin coconut oil that I could try on it. Is there anything specific I need to worry about, such as it being dangerous for them to lick off? GrannyJu, I've been looking at their shampoos and conditioners, as someone else recommended those as well! Would bathing her in it be alright since it is a conditioning product? In other words, do you think the conditioning effects of the products would outweigh the drying-out effects of another bath? I've never used any GG products, so any advice is appreciated! I also looked at an aloe vera melt that they have that is marketed for dry skin, has anyone tried that or have any opinions on it? Update: Maggie and I tried coconut oil first the other night since it was laying around. I rubbed it in well and wiped off the excess with a towel. I held her for quite a while afterward to make sure she wouldn't lick any spots I accidentally missed, just in case. Her hair already looks so much better, and her skin seems less dry. On another note, last night I was holding her, and she started passing gas. We are talking LOUD, seemingly uncomfortable, extremely smelly gas. I felt her belly, and while it wasn't overly tight, it did feel more tight than usual. She had just finished eating, so that could have been part of the slight rigidity. It still seemed off to me, so I spent a while gently massaging her tummy. Since she never likes her belly touched, it was difficult to tell if it hurt or she was simply aggravated. She finally passed some poo, and by some, I mean a lot. They seemed normal in shape/size/consistency. 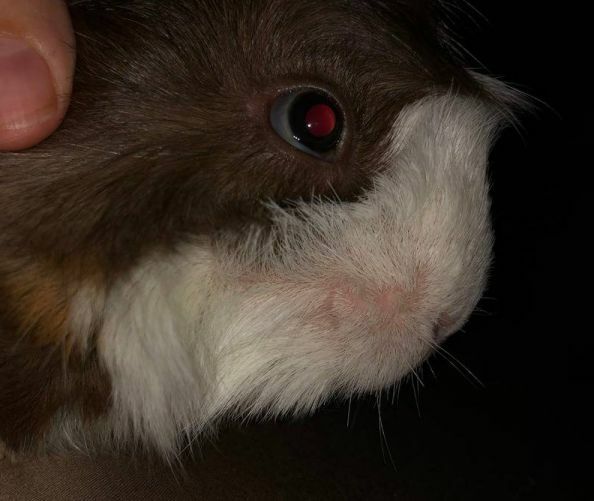 Does anyone know if gassiness like this is normal in guinea pigs, or could it have been the beginning stages of bloat and needs an extra eye on kept on it/preemptive trip to the vet? I've heard of them passing silent but deadly gas, but not the high-pitched whine that accompanied hers last night.